If multi color leather dress shoes make your fashion meter start beeping, you'll love what Giovanni dress shoes are all about. 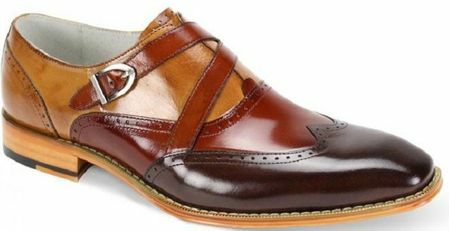 These multi color chocolate brown, cognac and tan leather dress shoes feature an Italian wingtip style ready for the fashionistas to take notice. Made of shiny chocolate brown, cognac and tan leather with leather lining in a Medium width.